These molasses/tahini cookies are Middle Eastern inspired, delicious, and easy to make! They are a very healthy cookie full of nutrients from the molasses and tahini. Also, they are vegan, and gluten-free too! And they are so very yummy. This recipe makes 10 – 15 cookies. Unsweetened coconut shreds for the top of the cookies for decoration. 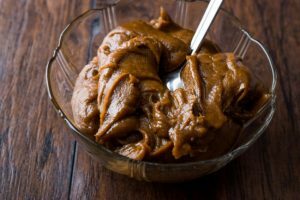 In a large bowl, add tahini, molasses, coconut oil, salt, soda, and stevia. Now mix in the rice flour and walnuts. Make small balls for the cookies and dip the top into the coconut. Then put them on an oiled cookie sheet. Press each one down so they are all flat. Remove from the oven, leaving them for 2 minutes on the baking sheet. Then transfer them to a wire rack to cool completely. Delicious Turkish Tahini and Molasses Dessert – This tahini and molasses dessert is from Turkey which they call ‘Tahin Pekmez’. It is so easy and fast to make as it requires no cooking or no baking. All you do is mix it up and that only takes a few minutes and voila it is done! It can be eaten with a spoon, but it is a very very sweet dessert. Traditionally it is eaten with fresh crunchy bread dipped in or mixed in it. Delicious Gluten-Free Hermit Cookies – These delicious gluten-free hermit cookies are not overly sweet which is why we like them. Best thing is that they are full of very healthy ingredients and are vegan too. They do have a bit of a drier texture than the ones with wheat in them but don’t be concerned and are still yummy.. Gingerbread Cake – Gluten free – This cake is simply delicious! The heat of the ginger balances off the sweeter elements so it doesn’t feel heavy. This was only recently perfected with some experimentation. I like the list of healthy ingredients you use in your cookies and other sweets. I look forward to trying them! Roxanne, happy you like the ingredients I use in my baking. It is a creative process making them. Look forward to hearing how they worked for you. Can I use a different flour? I didn’t want to buy that flour for just one recipe. Julie, I apologize for not replying to you till now. Just a little too much on my to-do plate. If you see below, Angel made these with oat flour. I am sure you can try any flour you would like. If you do, we would love to know what you did. I am not much for baking but these cookies were so easy to make! I made them with oat flour (I just blend oatmeal, a lot more economical!) and topped them with a sprinkle of flax seeds instead of coconut as I was out of it. Delicious!!!!! Thank you, Angel for letting us know how you made them and that they were easy. Like that you are creative and used flax seeds since you didn’t have coconut.